Psalm 133 joyfully declares, “How very good and pleasant it is when kindred live together in unity!” (NRSV) I have experienced this kind of pleasure whenever I get the opportunity to work with other clergy and Christians in our county. It is invaluable to be on mission with so many gifted pastors and prophets, missionaries and ministers. 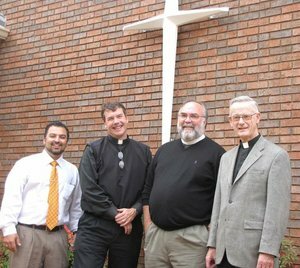 Recently, in 2011, Father John and I participated in a community Thanksgiving service with St. Simon’s Episcopal Church and Epiphany Lutheran. Funds were collected for Family Promise of Newrock. Obviously, some are more outstanding than others. One of the greatest pastors I’ve worked with–and learned from–is Father John Kieran, beloved priest of St. Pius X who recently announced his intention to retire from St. Pius this summer. I first met Father John back in 2004 when he and I worked together on an inter-faith dialogue related to immigration reform. It was a contentious time in the life of our nation, and all things immigration was one of the controversial debates going on in the midst of a heated election year. I had a passion for the topic and grieved that more churches were not weighing in on this important issue, so Trinity arranged for the dialogue to happen with other clergy. Father John was one of the first ministers on board, and I admired his courage (not many clergy wanted to get involved) to take a stand. Also, his interest and passion on the subject hit close to home considering that St. Pius had–and has–a significant Hispanic population. When we held the dialogue, a crowd from St. Pius X attended and outnumbered the Baptists in the room. It was an honor to be with Father John, hear his own views on the subject (not to mention his passion for justice and human rights), and meet his flock. Fast-forward about eight years later, when Family Promise of Newrock came upon the scene. Family Promise, one of the newest non-profit groups in our community, is an organization that works with places of worship in order to house homeless families. The concept–a simple one that lets so many of us fulfill Christ’s call to serve the poor–attracted the likes of many congregations, St. Pius included. I joined the board early on; and, in our first year of meeting, Father John was present and passionate about getting the organization off of the ground. He worked closely with Epiphany Lutheran and the other churches involved; denominational loyalty and Catholic-Protestant issues never became a hindrance or focus in any of the meetings. He insisted that his church participate in fundraisers year round, including the annual community Thanksgiving worship service. All this time, I have come to admire Father John’s commitment to his congregation, to our community, and especially to issues surrounding justice, pro-life initiatives, and public policy. It’s courageous clergy like that who inspire people’s belief in the Living Christ and restore hope in the church. Whenever I hear someone decry Catholicism from my neck of the woods, I always point to St. Pius X and her Shepherd as a model for Catholic integrity, vibrant missions, and dynamic, ecumenical ministry. Sure, it hasn’t all been fun and games. There are many subjects of which Father John and I disagree–there will always be that rich diversity in God’s Kingdom. And, like this Italian pastor (yours truly) who lets the New York attitude fly every now and then, Father John’s Irish enthusiasm can overwhelm those with whom he disagrees. Yet, ministry runs deep in that (fighting Irish green!) blood of his, and I have a feeling Father’s retirement won’t mean that he’s leaving the church so much as he is simply bringing the church with him wherever he goes to make new believers, friends, and communities of integrity. Father John, Trinity Baptist Church and I wish you safe travels, God’s power (to pilot, uphold, and guide you), and blessings for years to come.